TubeNet • View topic - 25 or 6 to 4? 25 or 6 to 4? Does anyone have a preferred quintet arrangement of this Chicago piece? Re: 25 or 6 to 4? "Highlights of Blood, Sweat & Tears And Chicago", arranged by Dwight Tibbetts. 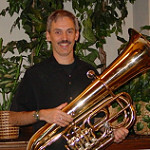 Tuba part is 6 pages long, and the '25 or 6 to 4' tune is towards the end. Basically a medley of Chicago hits. I haven't been able to find this piece. Sent an email to Mr. Tibbetts to try to find a source. dgpretzel wrote: I haven't been able to find this piece. Sent an email to Mr. Tibbetts to try to find a source. Let us know if you find a source. I should have asked about "Does Anyone Really Know What Time It Is? ", too. dgpretzel wrote: I should have asked about "Does Anyone Really Know What Time It Is? ", too. Does anyone really care? I can't imagine why. 25 or 6 to 4 on the tuba reminds me of the joke about knowing that a tomato is a fruit, but knowing better than to put it in a fruit salad. I heard from Mr. Tibbetts. He was very responsive and accommodating. He explained that this was an old arrangement, and he didn't have it immediately at hand, but will try to dig it out when he returns to his office in Maine, where that chart is archived on an old system. He indicated that he expects to return to Maine May. Very interesting... he mentioned that he studied with Chuck Winfield (of Blood, Sweat, and Tears) for two years, while in college. I'm looking forward to being able to buy that medley, when it becomes available again. If this becomes available, I would be happy to buy a copy. mikebmiller wrote: If this becomes available, I would be happy to buy a copy. I would also buy a copy. I talked to our horn player about this piece last evening at quintet rehearsal. She is also our librarian and treasurer. Our music library is HUGE Anyway, she accumulated many pieces from her previous quintet many years ago, including this 'Chicago' piece. She told me it was sort of a one-off piece and (I think) got it thru someone who was in Tibbetts' quintet many years ago. We have many obscure/rare/one-off pieces that were never really put into print. I will tell you it is a workout though - 6 pages and never comes off the face But you can play sections from it and not the whole thing if you choose. I downloaded a band score and made my own arrangement for a small wind ensemble I was part of to play. If you use Noteworthy Composer, I'd be happy to e-mail you my file. By the way, we're coming back to Alaska in August. Schlepporello wrote: I downloaded a band score and made my own arrangement for a small wind ensemble I was part of to play. If you use Noteworthy Composer, I'd be happy to e-mail you my file. Schleppy, there is one more way of transfer like when you helped me out on a hymn file, I couldn’t open (I have no idea of DG’s computer setup). More cumbersome, but working. Make screenshots on your big desktop monitor, and send them as.png or .jpg. Oh yeah! I could do that!